WILL Grigg admits he came back to Wigan Athletic ‘raring to go’ from the latest international break. And the Northern Ireland international has certainly brought his shooting boots with him. It had been something of a frustrating start to his Latics career for Grigg, who arrived at the DW Stadium from Brentford for around £1m over the summer. 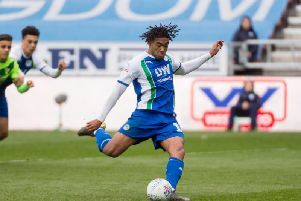 International commitments, as well as a freak elbow injury sustained last month at Port Vale, had left him searching for the kind of form that alerted Latics and a host of clubs to his services. But three goals in the space of three days – a brace against Colchester and a vital effort at Peterborough in midweek – shows he’s back in the swing. And having helped Northern Ireland book their spot at next summer’s European Championships, he’s anxious to make up for lost time at club level. “I wanted to come back from international duty on a high, and I need to get some games under my belt now, Grigg told the Evening Post. “I know I’ve missed a few Wigan games with injuries and international duty, but I’m feeling good now. It’s been a barren three decades for Northern Irish football, with their last qualification for a major championships coming at the 1986 World Cup in Mexico. But Grigg and his colleagues got the better of Romania, Hungary, Finland, Greece and the Faroe Islands to book their place for next summer’s Euros in France as group winners. “The lads have been quality throughout the campaign, and we finished it in style,” Grigg said. “It’s something we really deserve and we can’t wait for the finals next summer. back-burner now for a while, but there’s another international break next month and that becomes the focus again. The 24-year-old has certainly hit the ground running on his return to Wigan, and it’s been fuelled by a ‘frustration’ at not being able to help his club side more. “The international breaks are so frustrating in League One, because the games go on,” he revealed. “That means you potentially miss two games, which again I did last week. “It’s just one of those things, and it is of course a massive privilege to be involved in international football. Tomorrow’s trip to Bradford can’t come soon enough and Grigg and Latics, whose back-to-back wins over Colchester and Peterborough have extended the unbeaten run in all competitions to eight matches. “I think it sends out a real message to the rest of the league,” Grigg added. With boss Gary Caldwell now having his entire forward line available for selection for the first time, Grigg knows he’ll have to stay at the top of his game to keep the likes of Craig Davies, Grant Holt and Jordy Hiwula out of the side. Caldwell has teamed Grigg with creative widemen Michael Jacobs and Yanic Wildschut in the last two games, and the centre-forward admits he’s enjoying the combination. “Myself, Cracker and Yanic have been working together in training and it’s paying off on the pitch,” he added.